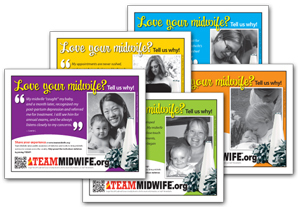 Featuring testimonials from actual midwife clients, these handouts encourage your clients to share their own stories on the Team Midwife Web site and to support Team Midwife's efforts to increase awareness of and access to quality midwife care. Great for displaying on your practice's client information board or around your front desk area. (Pack of five designs, full color, single-sided 8.5" x 11" page). We're building our collection of stories and photos to reflect diversity, both in clients' cultural backgrounds and the variety of their midwifery experiences (ie primary care, birth control counseling, etc.) Please encourage your clients to share their stories and photos and read other client stories at www.midwife.org/Share. Smaller (half page) versions of the full page testimonials, perfect for including in new client information packs. (Pack of four designs, full color, single-sided 8.5" x 11" page, 2 flyers per page). These smaller, colorful Quick Cards are handy for including in new client information packs or having available for clients in your reception room. (Pack of four designs, full color, double-sided 8.5" x 11" page, four cards per page). Choose from the standard Team Midwife badge or "I'm a FAN!" 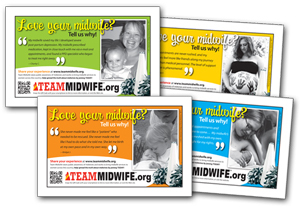 to show the world your support of the work of midwives on your website or blog. http://www.midwife.org/ACNM/fi... style="FONT-WEIGHT: bold"> Or click here to download non-linked standard badge art. Or click here to download non-linkded fan badge art.